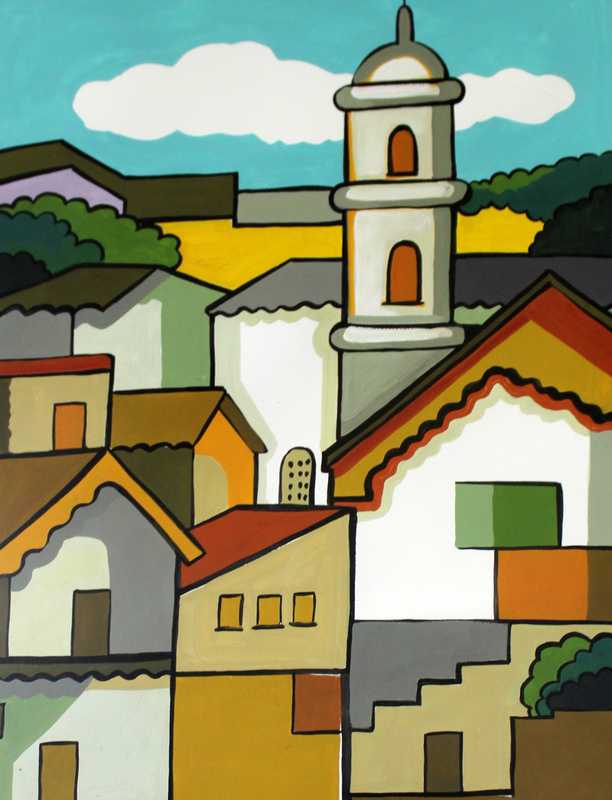 Why does an artist choose one medium over another? 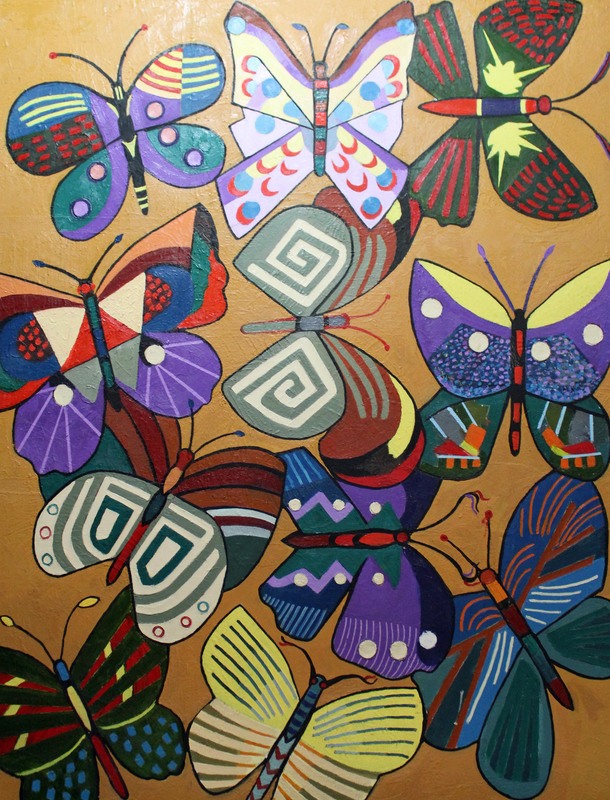 How does an artist stay motivated enough to create beautiful art year after year? Why would an artist get involved in politics? 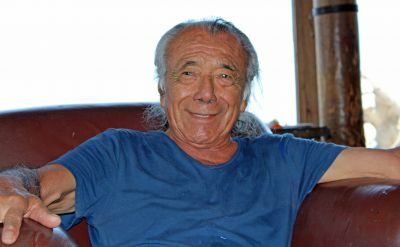 And why would an octogenarian artist continue to work 10- or 12-hour days instead of enjoying a carefree retirement? 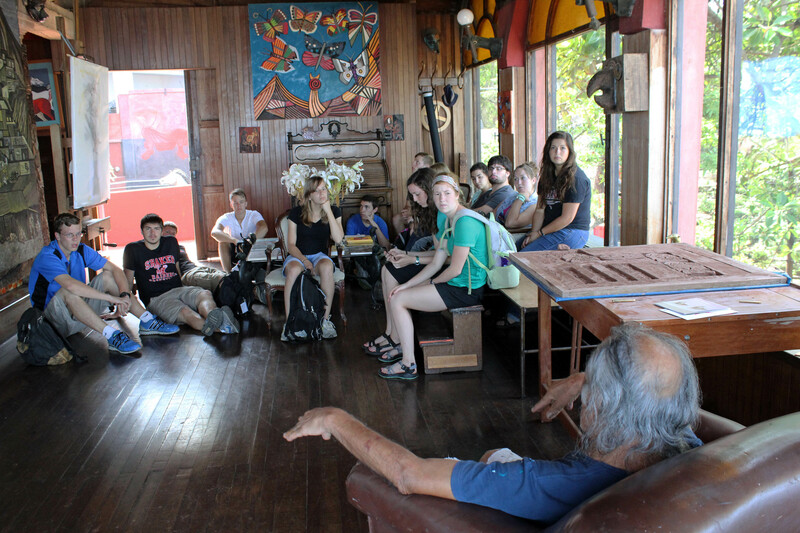 Goshen College students got answers to those and other questions while gaining insights into the creative process during a visit to the home and art studio of Victor Delfin, Peru’s leading painter and sculptor. Portrait of an artist: Victor Delfin, Peru’s most famous artist. 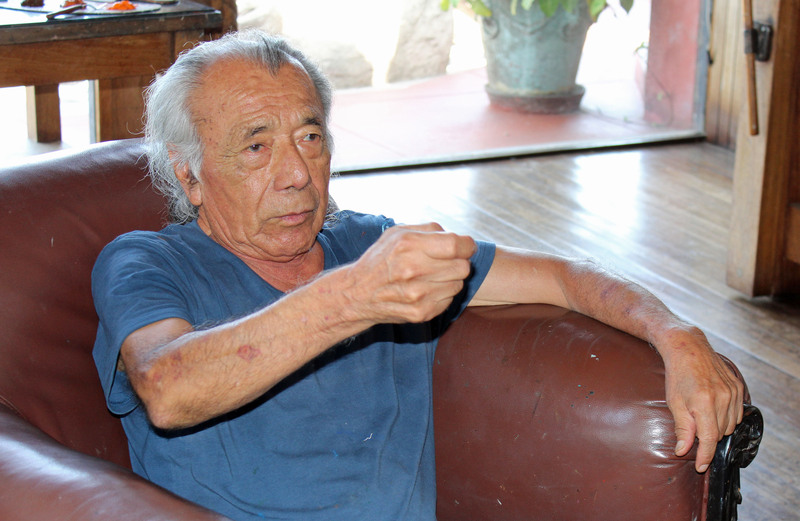 Delfin, 86, is considered Peru’s most accomplished artist. 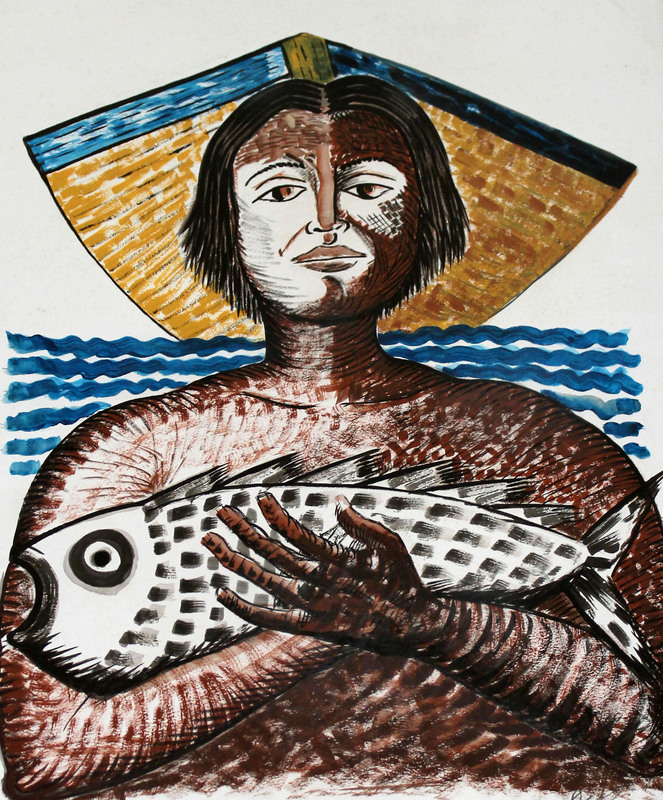 The youngest child in a poor family from a fishing village in northwestern Peru, Delfin graduated from the National School of Fine Arts in Lima in 1958. 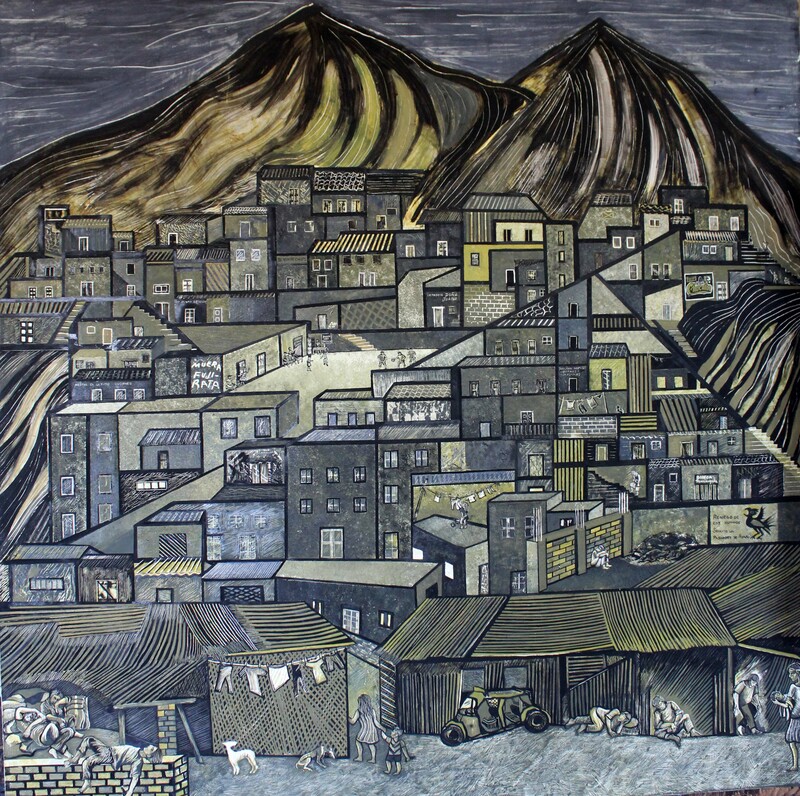 He served briefly as director of the Puno School of Fine Arts and then as an art teacher in Chile. 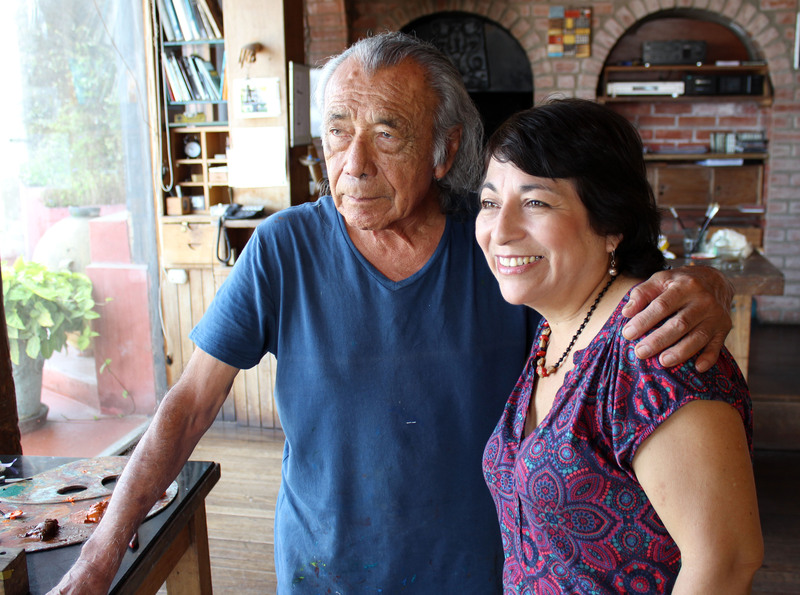 Forty-nine years ago, Delfin established an eclectic art studio in the seaside district of Barranco, and he has been there ever since, producing art that has won many awards and honors. 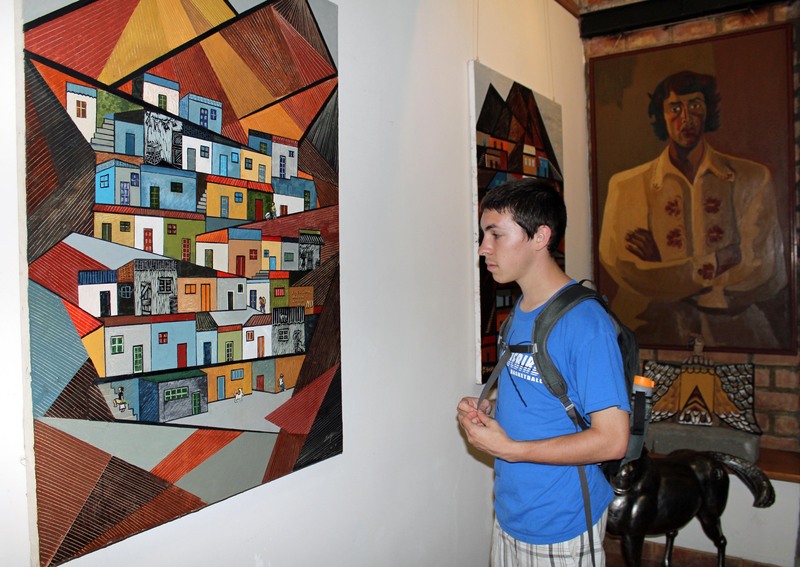 Jonathan examines a painting by Victor Delfin. 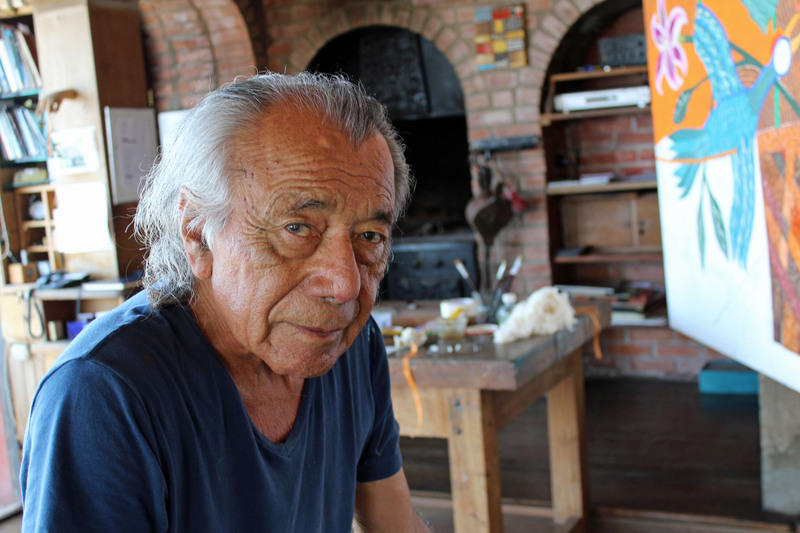 Delfín, whose art is shown in major museums across South America, North America and Europe, works with many materials, including wood, metal, canvas, polychrome acrylics and aluminum – whatever strikes his fancy at the moment. He insists that he has no favorite medium. 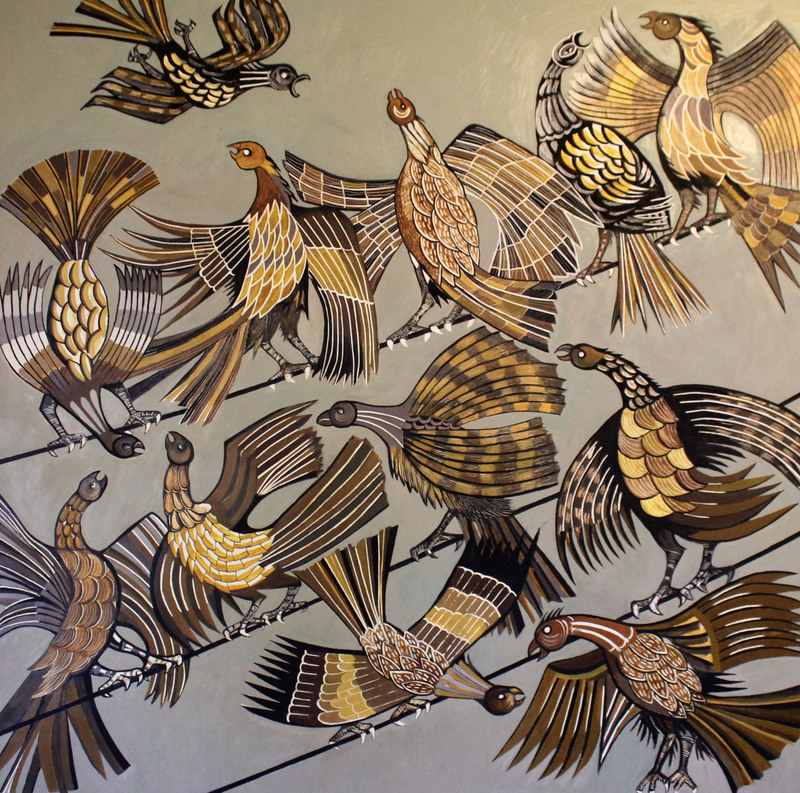 He is especially known for large metalwork sculptures of birds, horses and other animals, as well as his sensual and colorful paintings. His best-known piece in Lima is “El Beso” (The Kiss), a 1993 sculpture of a couple locked in a passionate embrace. 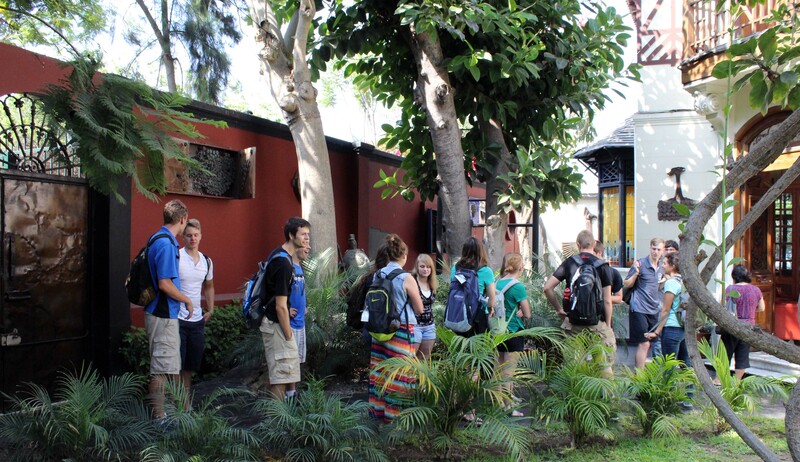 It is located in Lima’s Parque del Amor (Love Park), and couples like to pose beside it for photos after weddings and especially on Valentine’s Day. 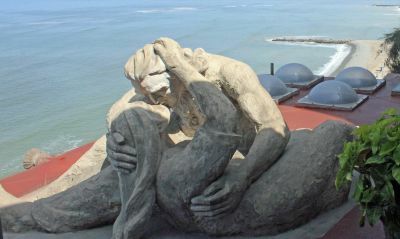 A model of El Beso, The Kiss, Victor Delfin’s most famous sculpture. 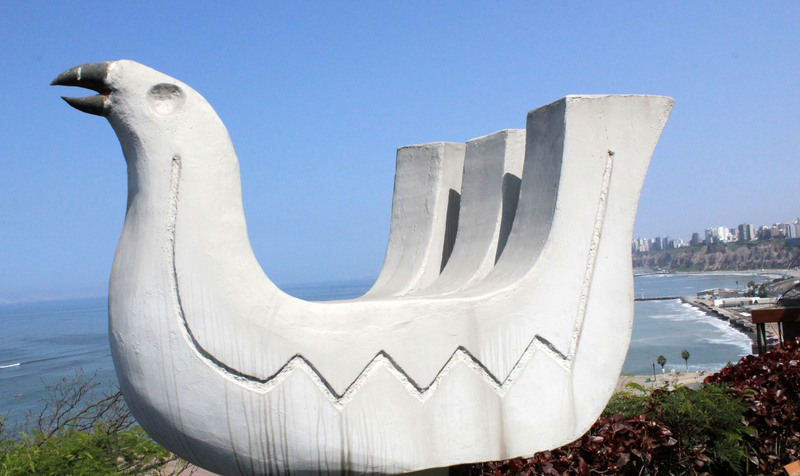 The full-sized sculpture is in a park in the MIraflores district of Lima. 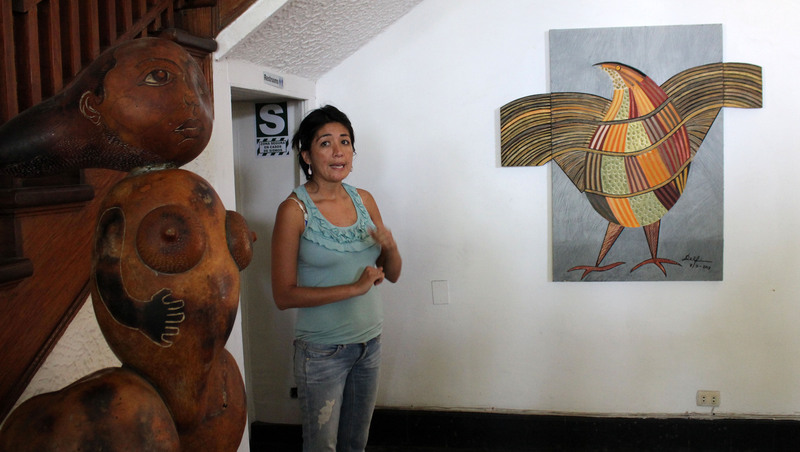 Delfin’s home is filled with art. 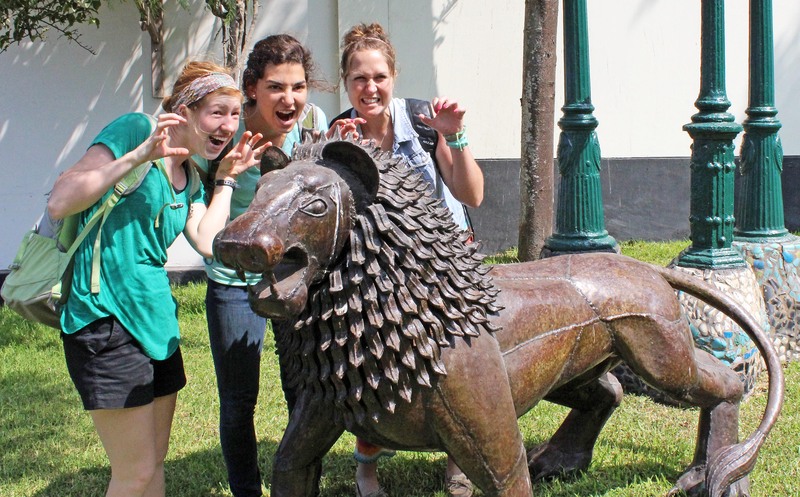 Outdoors, we saw many sculptures, including angels, a bull, a horse and a lion. A sitting room held a hand-made chess set and wood and leather chairs made by Delfin. Even the bathroom in his studio was a work of art, covered in a mosaic of original tiles. 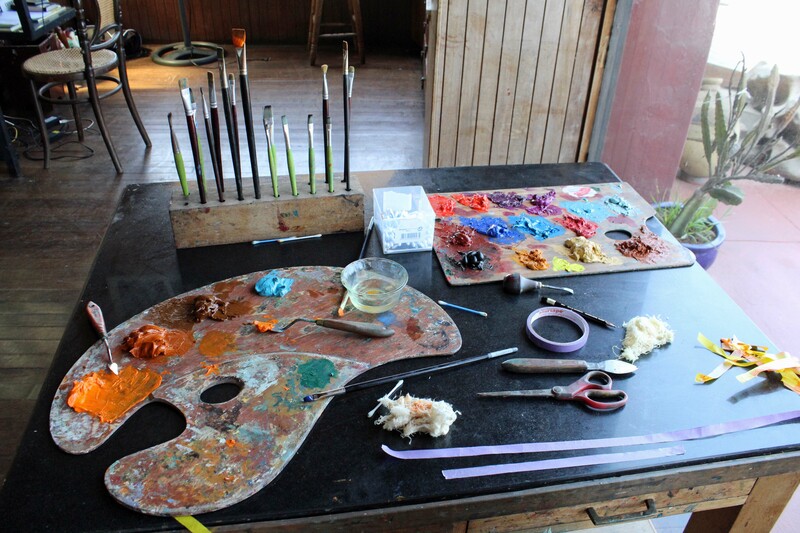 Wide windows in his studio overlook a great expanse of the Pacific Ocean, beautiful on a sunny morning. Natalie, Gretchen and Malaina strike a ferocious pose. 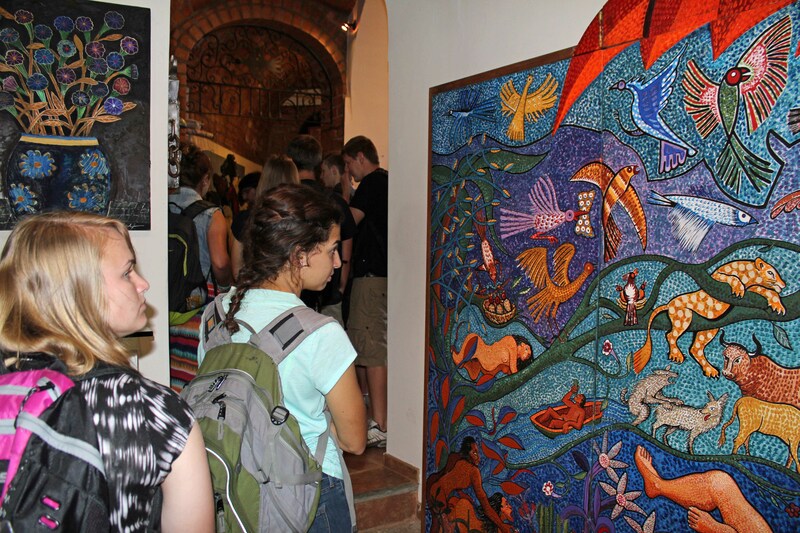 Students were attracted to Delfin’s many colorful paintings of birds and horses, the large outdoor sculptures and a series of paintings of shantytowns, including one that depicted the grim aftermath of a devastating tuberculosis outbreak. 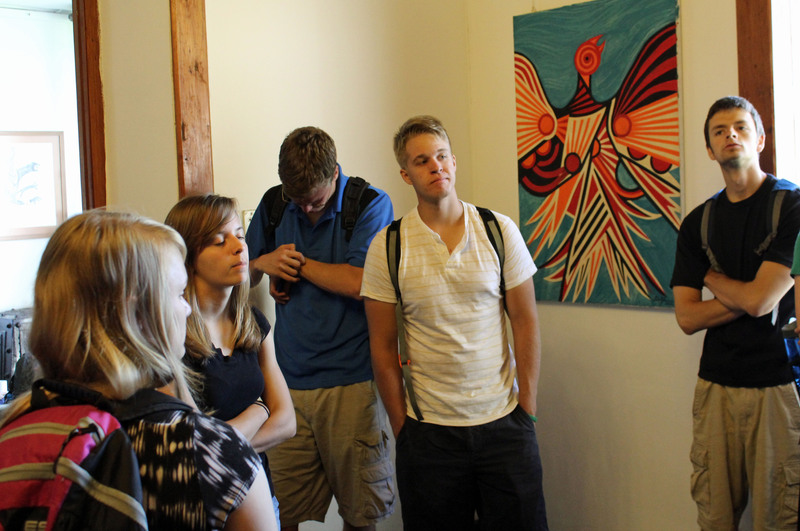 Students also spent time viewing a painting that depicted the misery of Peru’s war against Shining Path terrorists in the 1980s and 1990s. 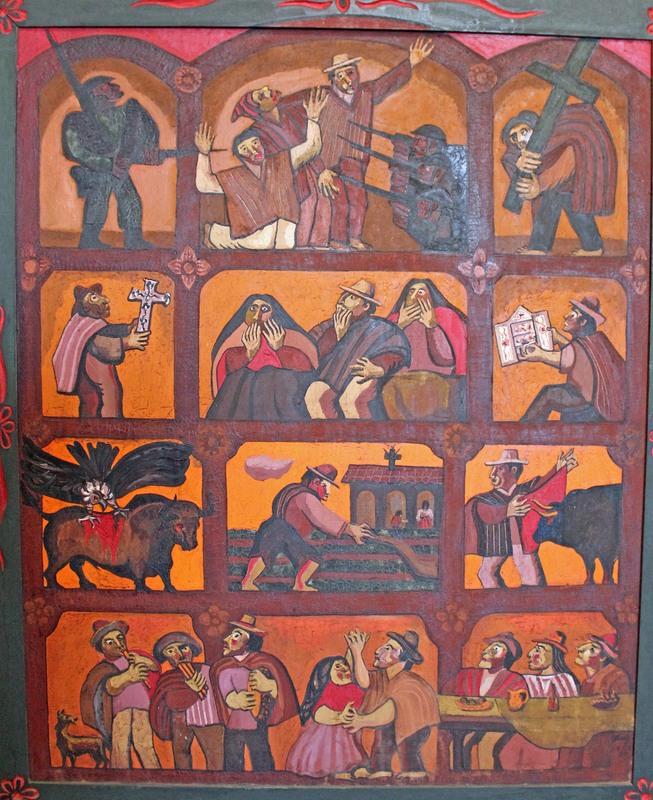 This painting by Victor Delfin depicts grim scenes from Peru’s bloody war against Shining Path guerillas. 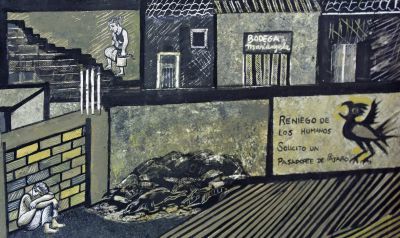 Delfin said his works often stray into such darker subjects as well as politics. He said he feels compelled to address social injustice and political themes in his art even though he conceded that collectors and museums seldom purchase such works; many end up permanently in his studio. Victor Delfin reacts to a student’s comment. Students pause for a photo in the sunny courtyard of Victor’s Delfin’s home and studio. 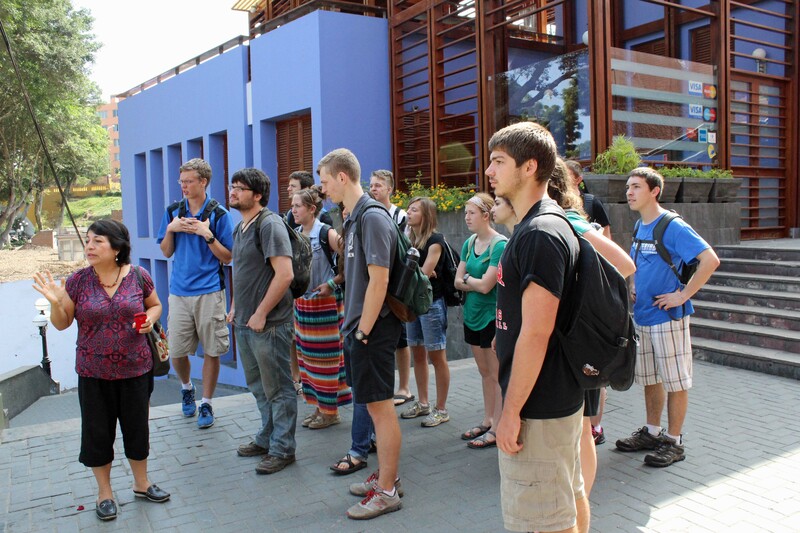 Students said the studio visit and conversation with Victor Delfin was one of their best field trips in Lima. 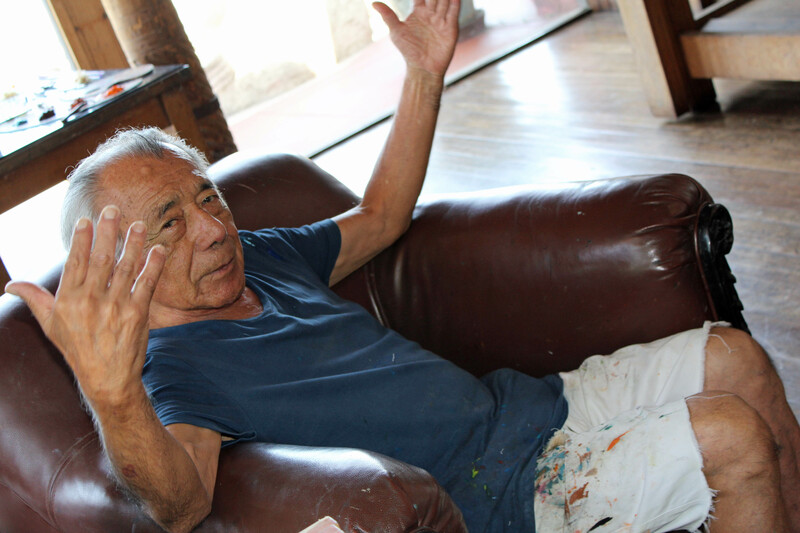 They left with a better understanding of Peruvian art and of a master who has proven that there are no age limits to creativity. 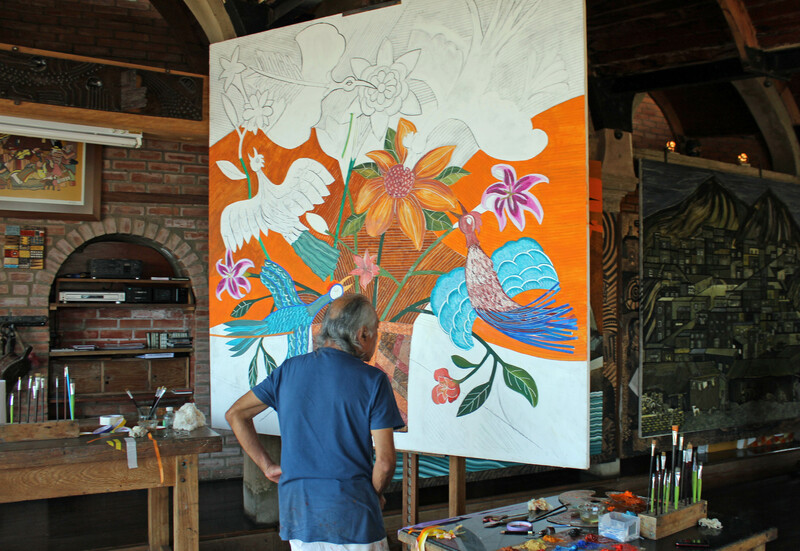 Victor Delfin, Peru’s best known artist, creates another painting at his studio in the Barranco district of Lima. 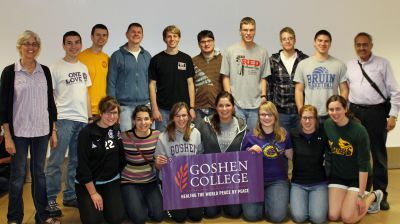 Lima Study Coordinator Celia Vasquez tells Goshen College students about the history of the Barranco district of Lima. 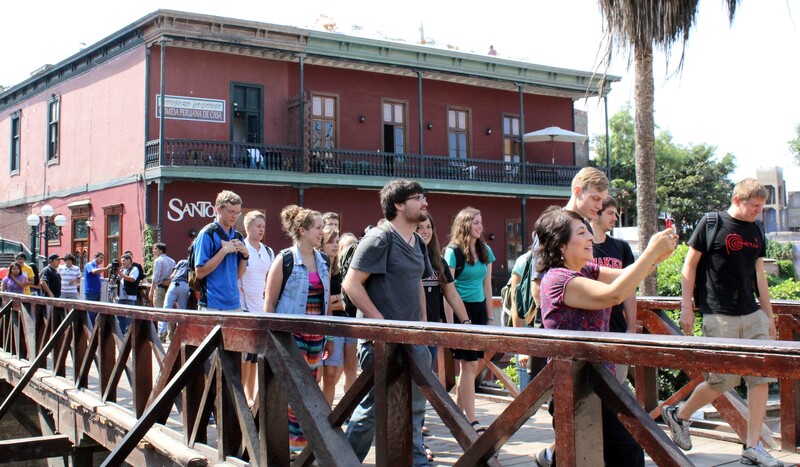 Students walk across the Puente de los Suspiros, or Bridge of Sighs, where young lovers once met. It is said that the wishes of first-time visitors come true if they hold their breaths while crossing the bridge. 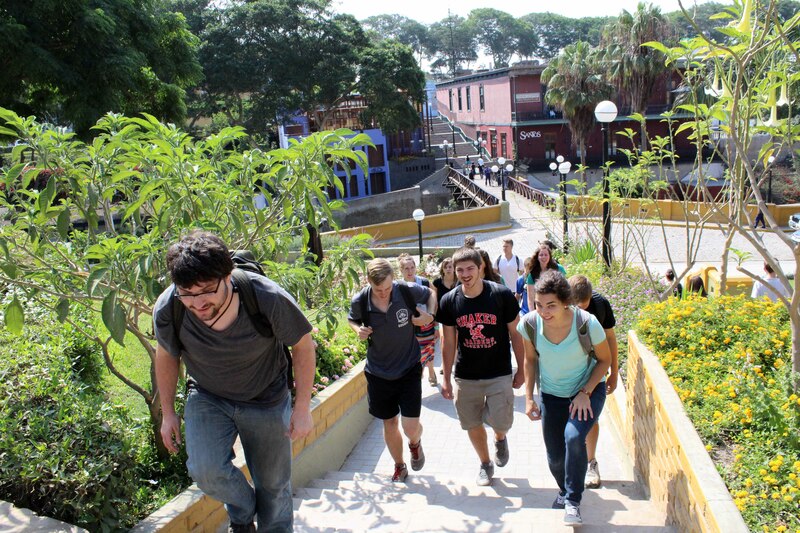 Students walk toward the home and studio of Victor Delfin. 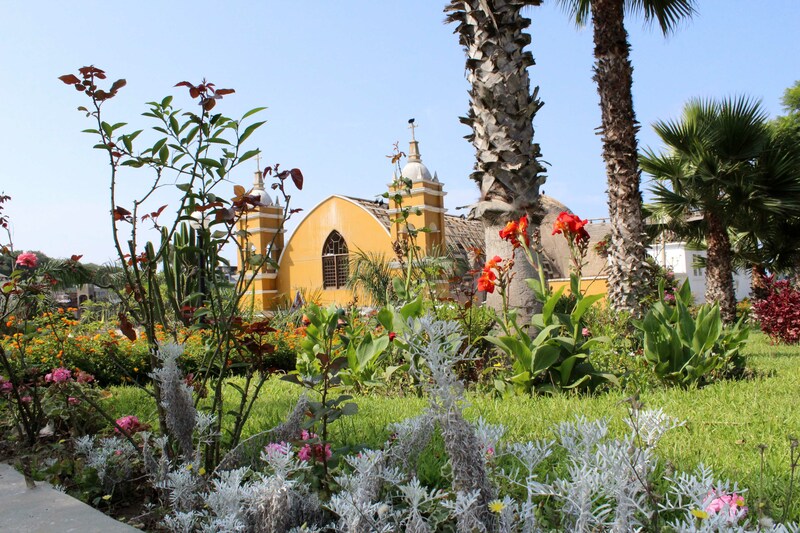 The Iglesia La Ermita (Ermita Church) in Barranco, which was built in 1805. 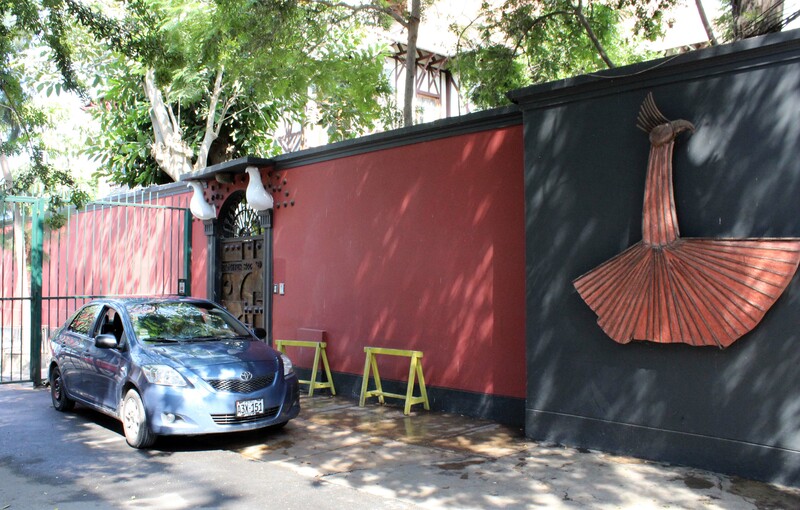 The entrance to the home and studio of Victor Delfin. 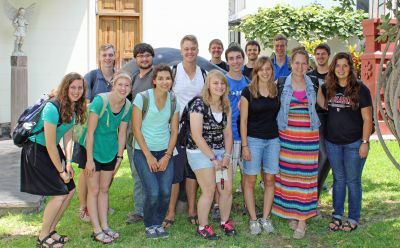 Students in the courtyard of the Delfin home and studio. 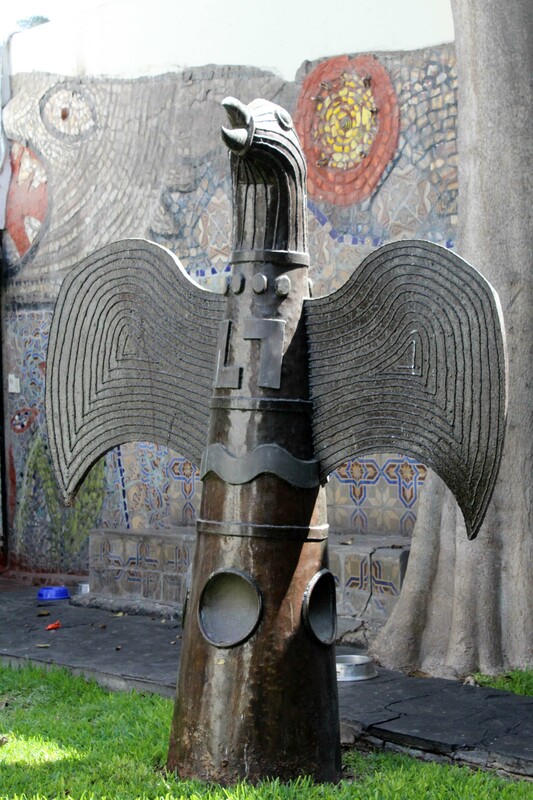 A sculpture by Victor Delfin. 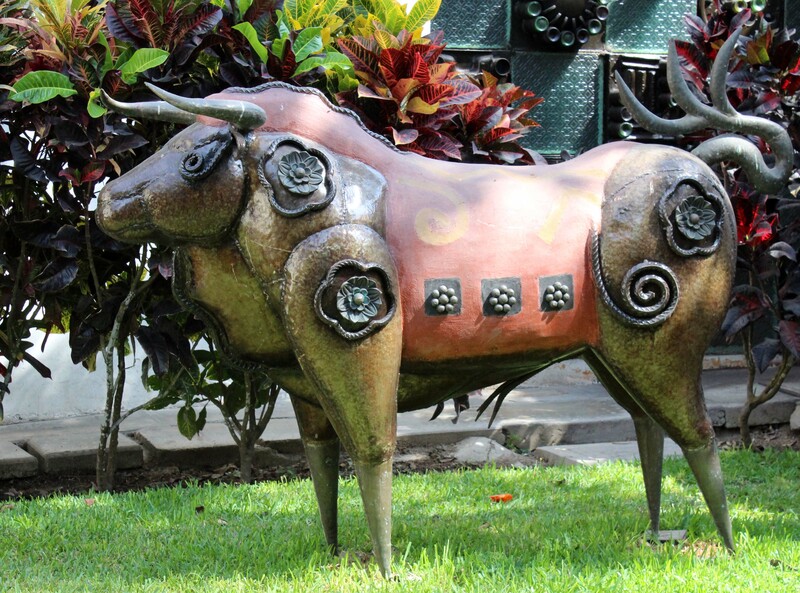 A bull created by Victor Delfin. 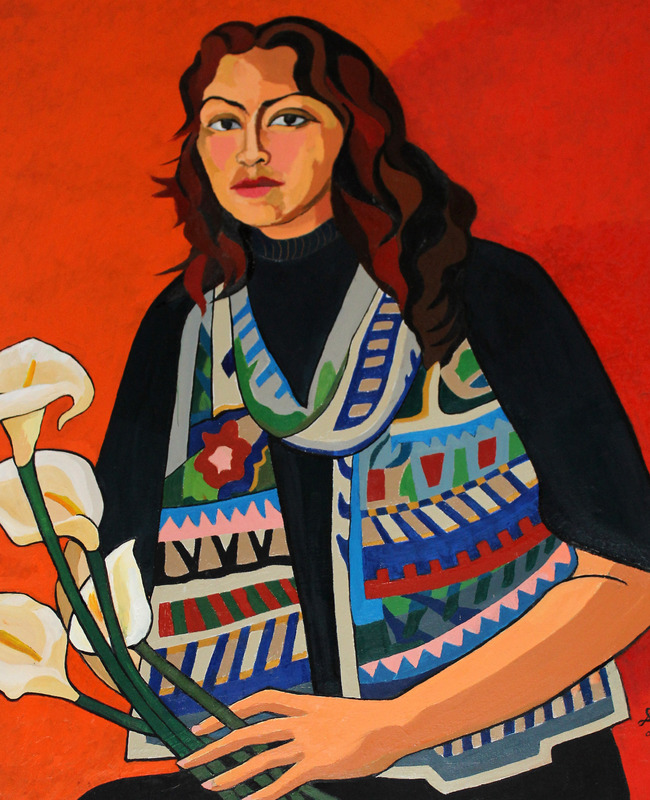 Maria Angela Delfin, the artist’s daughter, leads tours of the home and studio. 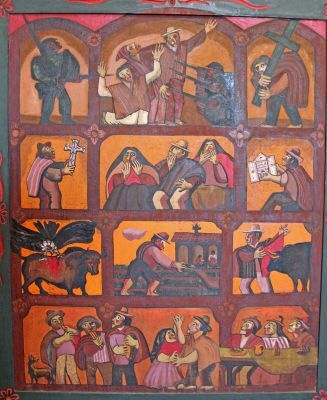 A painting by Victor Delfin. 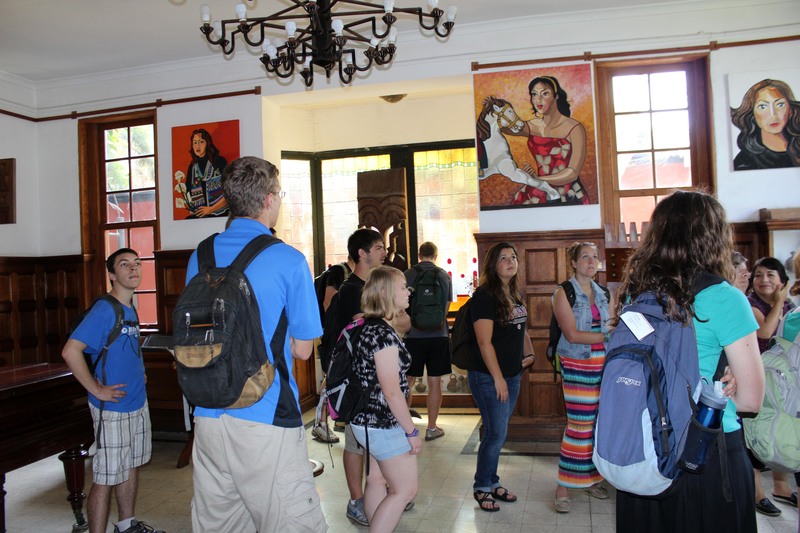 Students tour the gallery of Victor Delfin. 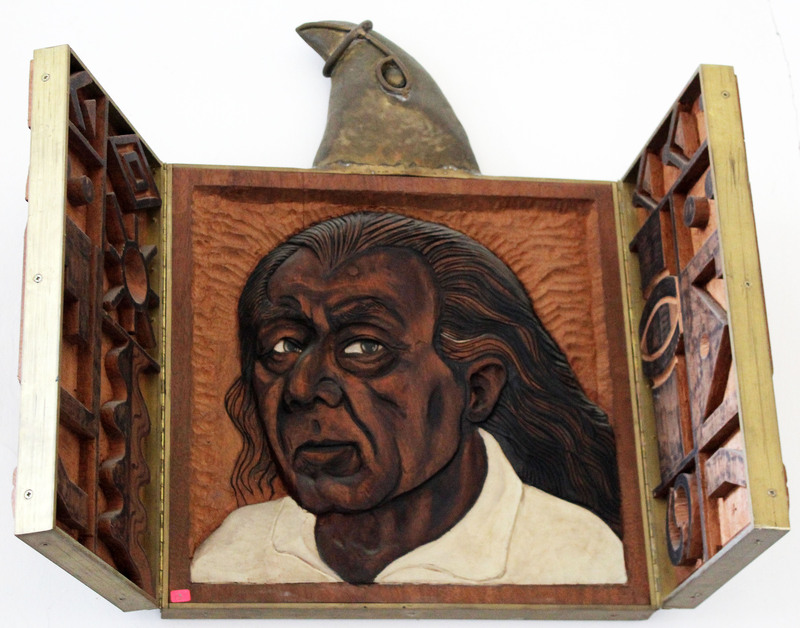 A self-portrait in wood by Victor Delfin. A flock of birds created by Victor Delfin. Aimee, Gina, Thomas, Derek and Neal in Victor Delfin’s gallery. 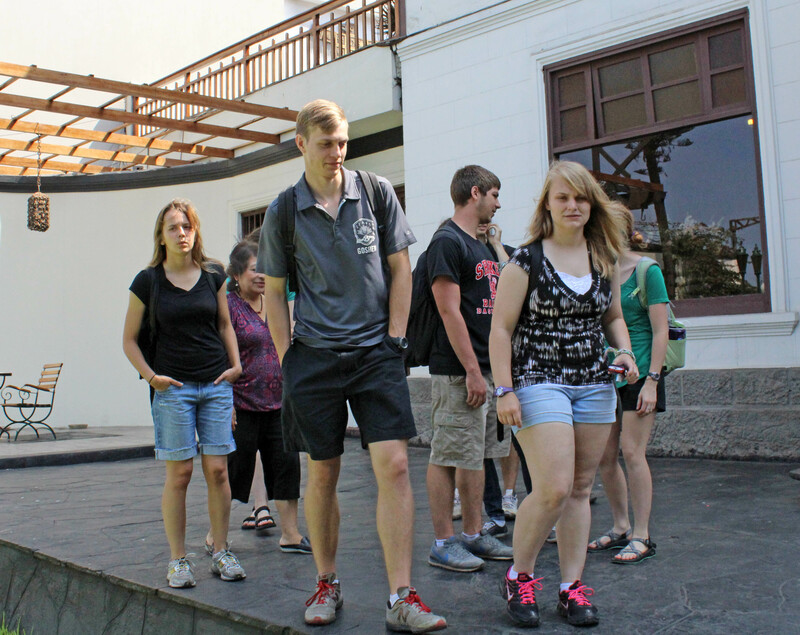 Students stroll toward outdoor sculptures by Victor Delfin. 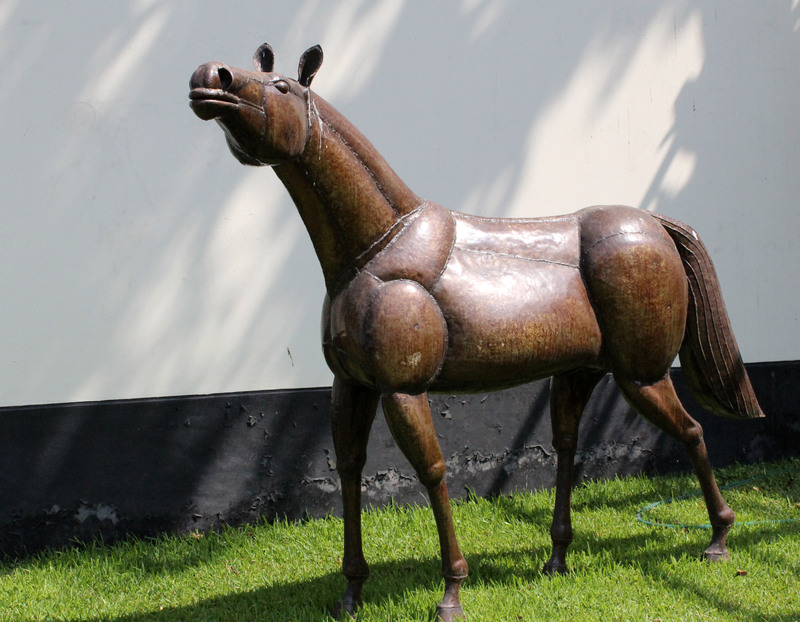 A spirited horse by Victor Delfin. 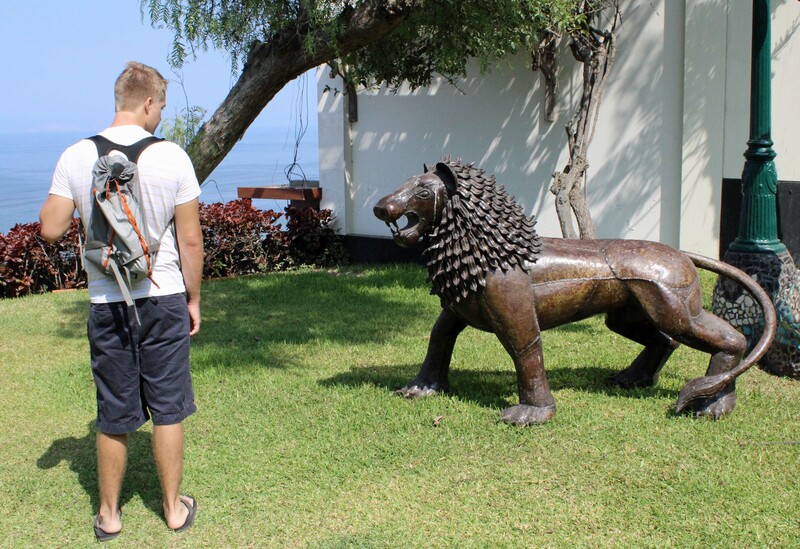 Derek examines a lion statue. 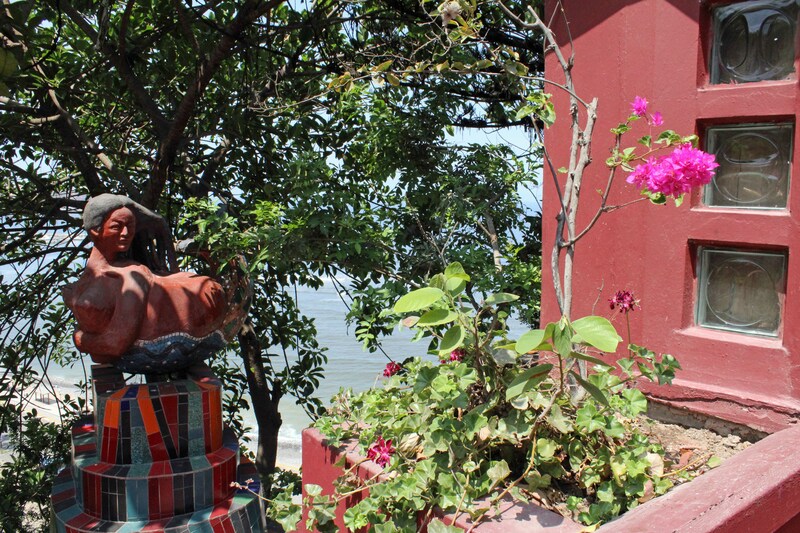 A model of a peace statue Victor Delfin created to commemorate the 1985 visit to Lima by Pope John Paul II. 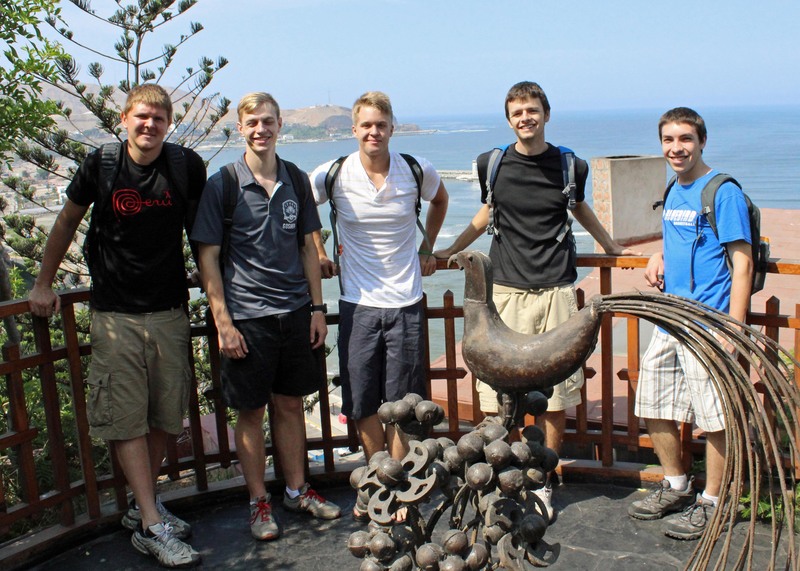 The full-sized statue is in the Jesus Maria district. 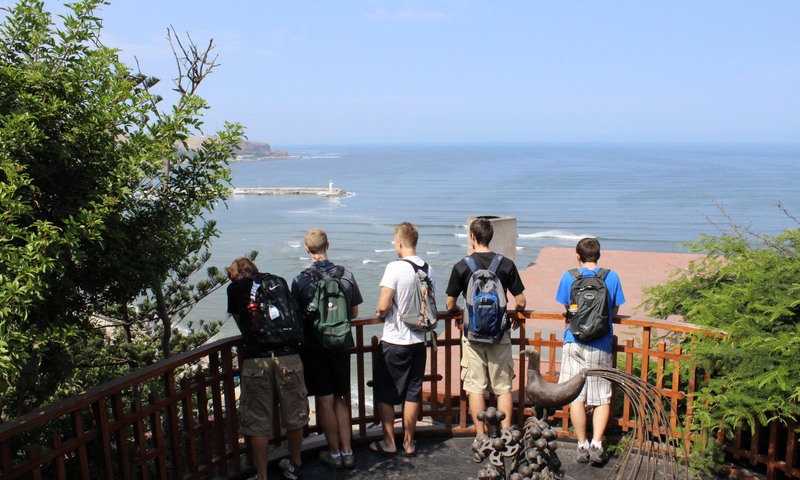 Dean, Jackson, Derek, Neal and Jake admire the beautiful ocean view from Victor Delfin’s home. Dean, Jackson, Derek, Neal and Jake. 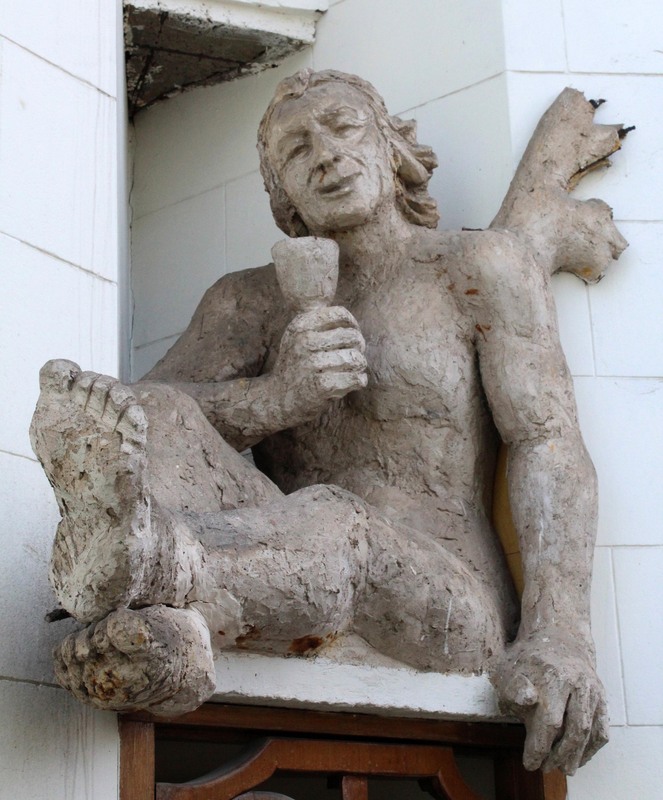 A statue by Victor Delfin. 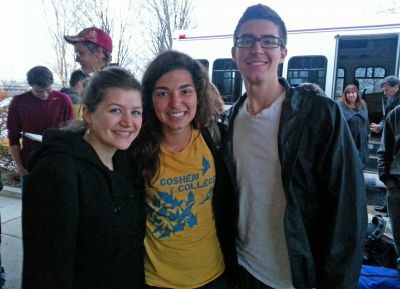 Just outside Victor Delfin’s studio. 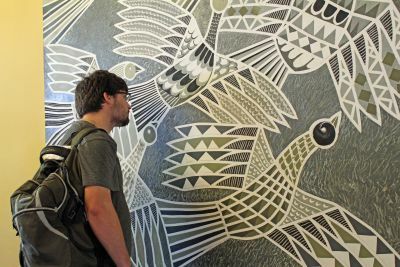 Jake examines a painting by Victor Delfin. Aimee and Gretchen in the Delfin gallery. 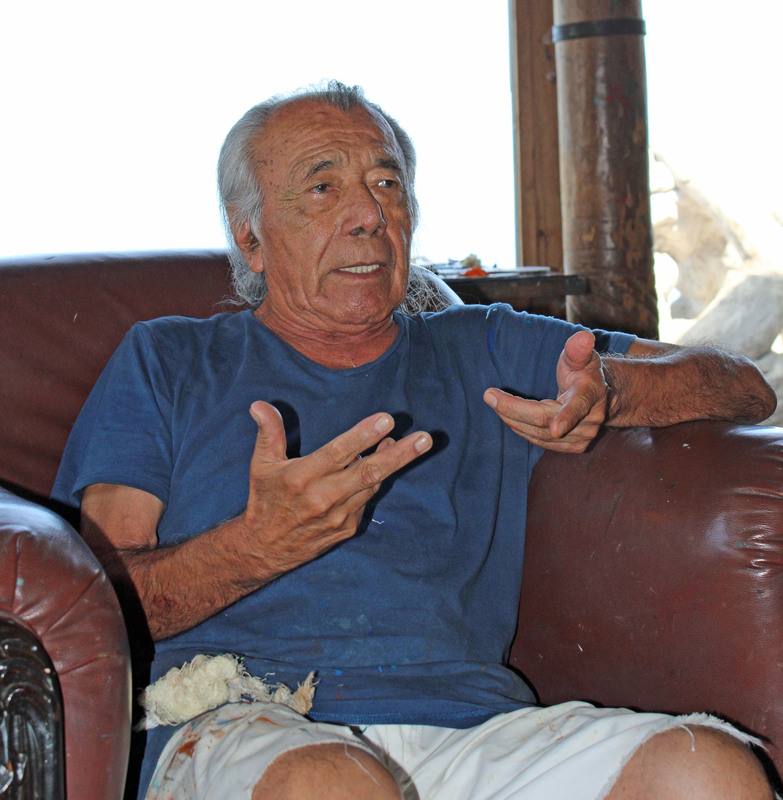 Victor Delfin discusses his art. 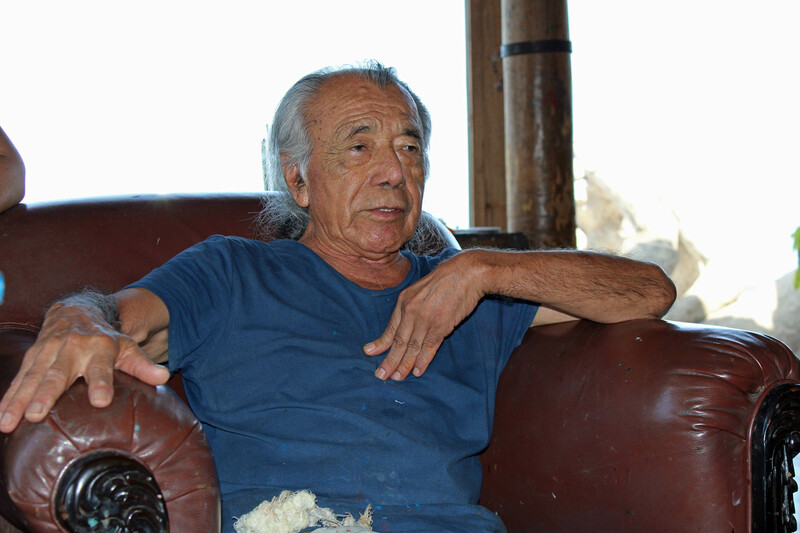 Students listen to Victor Delfin. Victor Delfin emphasizes a point. 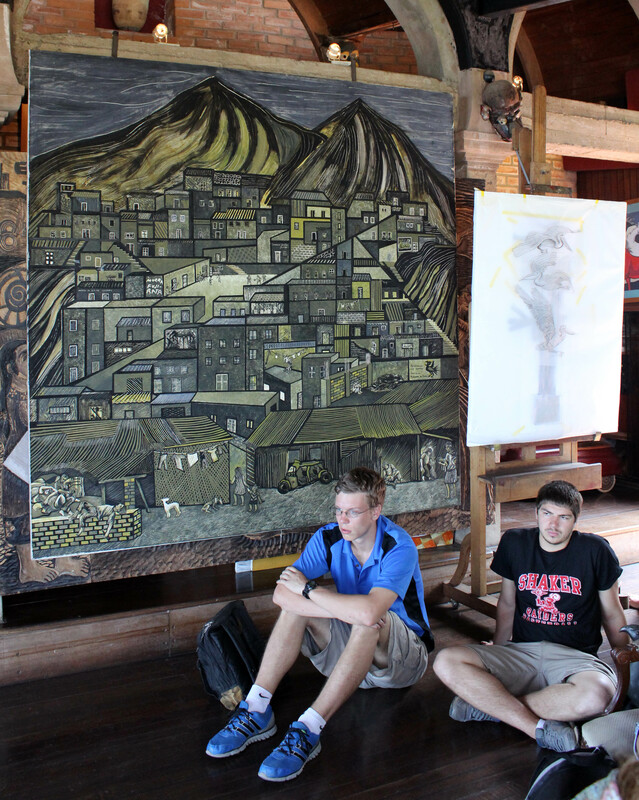 Thomas and Caleb beside a painting that depicts a tuberculosis outbreak in a Lima shantytown. 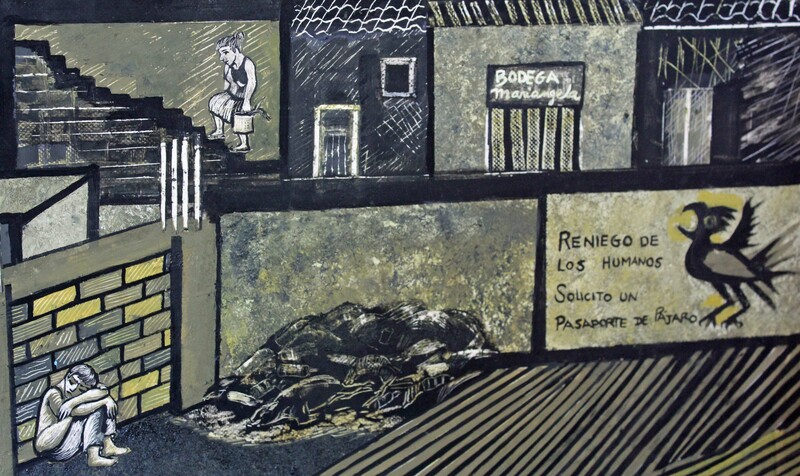 A Delfin painting that depicts a tuberculosis outbreak in a Lima shantytown. 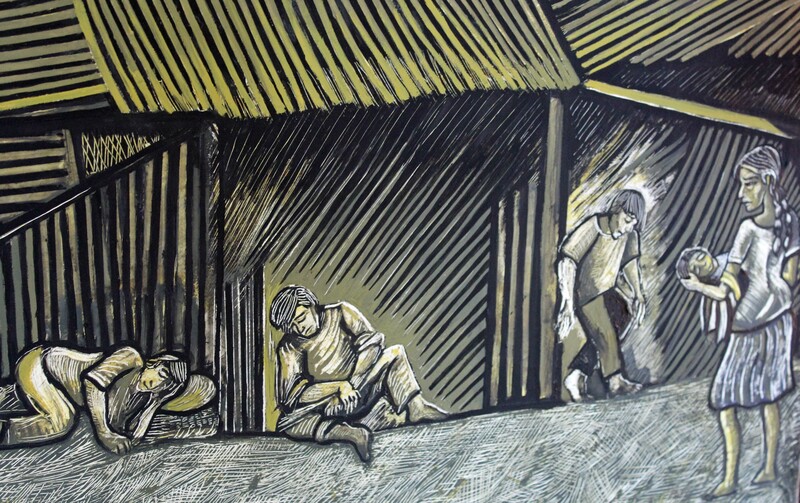 Another tragic scene from Delfin’s painting that depicts a tuberculosis outbreak in a Lima shantytown. Victor Delfin makes another point. Victor Delfin’s paint-spattered shirt and shorts are evidence of his colorful work. 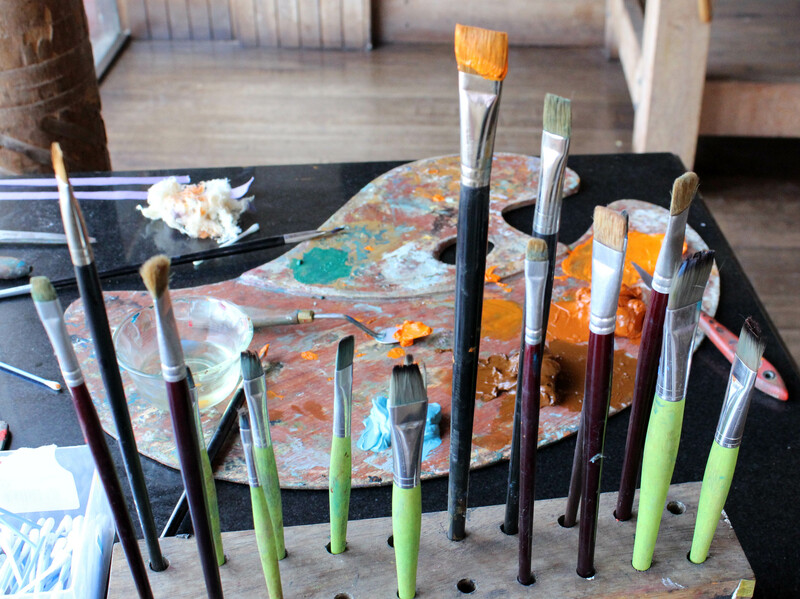 Tools of Victor Delfin’s trade. 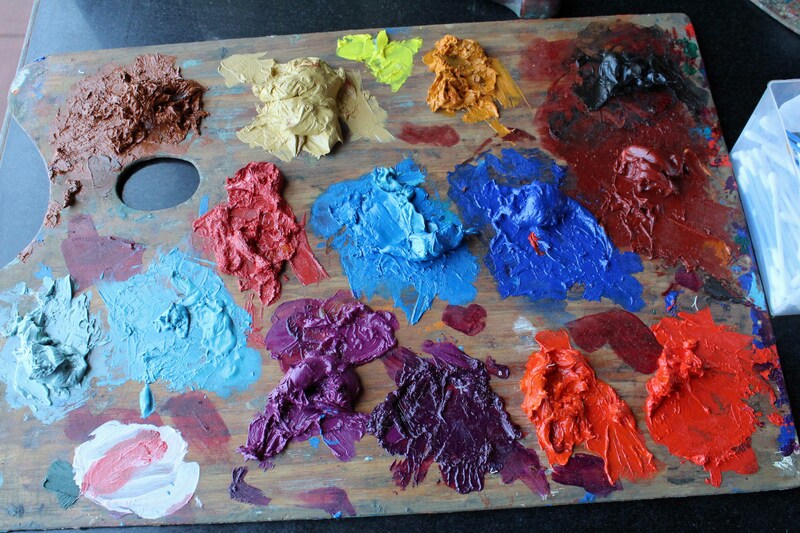 The colors of Victor Delfin’s life. 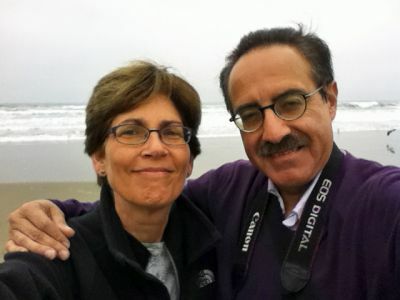 Victor Delfin with Lima Study Coordinator Celia Vasquez.